Sold as Pair with Large Cupped Washers and Sticker. 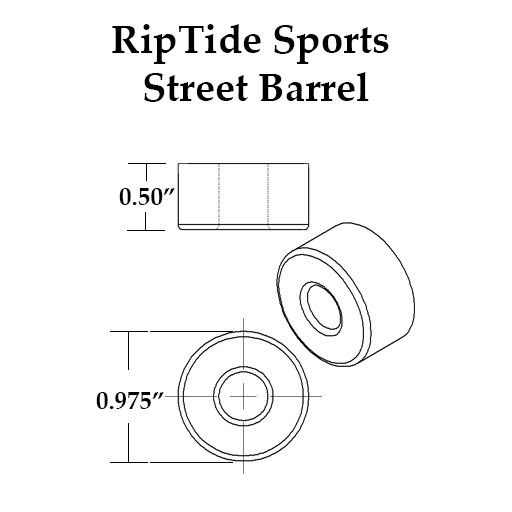 Street Barrels offer the next step up in stability above the Cone shape. The ShortStreetBarrel / StreetBarrel setup is for those looking for higher stability at higher speeds but still highly maneuverable and awesome for landing tricks. Choose the The ShortStreetCone / StreetBarrel setup if you're looking for a carvy or surfy feel but with a bit more stability. With this choice the resistance is more constant or linear throughout the range of motion. RipTide Bushings are the best carving bushings that exist. Period. There is nothing better. They have about 25% (or more) rebound / flex than *any* other brand skateboard bushing. This applies both to APS and to KranK (not sure yet which one has more rebound). I frequently about 10 - 12 decks with various carving trucks, Tracker Trucks Dart & Sixtrack, Gullwing SuperPRO III & Mission M1, Surf-Rodz TKP and Bennett Vector. I'm replacing *ALL* my bushings. First stock bushings with Khiro, Venom, Riot, Independent, Doh-Doh's, etc. and now all those with RipTide bushings. They are that good. I really think I can feel a difference. Great product. Only complaint is that a lot of durometers are missing for the street trucks and standard sizes for my trucks are no made, so I have to grind a bunch of Longboard bushings to fit my trucks. These bushings are unbelievably responsive with the perfect dose of rebound and control. I know now why people don't turn back once they install some Riptides. Brad gave me some great suggestions on a combination of bushings for my Gullwing Sidewinders (on a sector 9 aperture) that resulted in the most buttery carving experience. If you have these trucks and you're about 150-170, consider the following combo: Bottom set - KranK 87a ShortStreetBarrel on top and StreetBarrel on bottom Top set - KranK 87a ShortStreetCone on top and StreetBarrel on bottom Pick these up! Don't think, Just do! Great quality bushings! I use the 93a shortstreet barrel with a 93a krank streetfatcone for picking up higher speeds on my indys. Nice and restrictive and allows you to adjust the turn of the trucks by turning the nut on the kingpin!